The superior quality Motorized Thickness Micrometer is available from us. The Motorized Thickness Micrometer has two models. The first is Dial Type Motorized Thickness Micrometer which is has a single push-button operation for lowering spindle speed and has a motorized dial type. The second is Digital Display Motorized Thickness Micrometer which has a digital display and is made of The Mitutoyo (Japan) make and has an add-on type optical transducer. Both the Micrometers are used for rapid and accurate measurement of thickness of paper, board and plastics. The Dial Type Motorized Thickness Micrometer is a single push-button operation for lowering spindle speed. The Dial Type Motorized Thickness Micrometer is used for rapid and accurate measurement of thickness of paper, board and plastic films, rapidly and accurately. The Dial Type Motorized Thickness Micrometer is used for measuring spindle with constant lowering speed (1mm/sec). The Digital Display Motorized Thickness Micrometer is used for rapid and accurate measurement of thickness of paper, board and plastics. 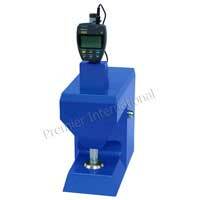 The Digital Display Motorized Thickness Micrometer is motorized, sturdy, easy to use and â��push the buttonâ�� operation. The Digital Display Motorized Thickness Micrometer has a Digital display, Mitutoyo (Japan) make add-on type optical transducer.